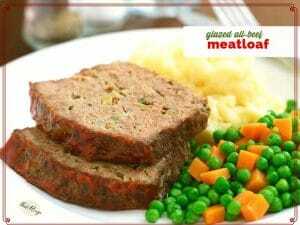 This flavorful All Beef Glazed Meatloaf is moist and tender with a tangy glaze for color and flavor. 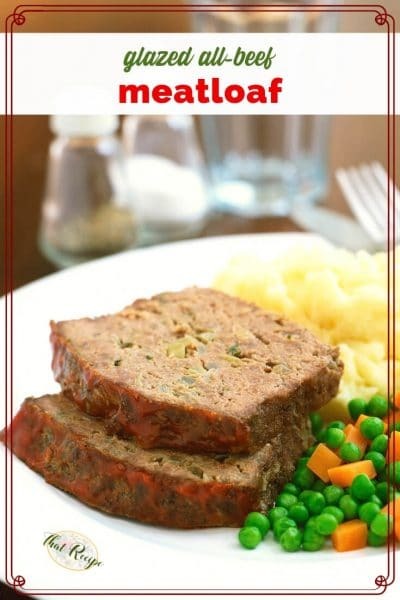 Many meatloaf recipes add two types of ground meats for flavor and texture. And they use a high fat content meat. This recipe, adapted from Cook’s Illustrated Cookbook uses a few tricks to keep the right texture and moisture: gelatin and powdered cheese. By freezing shredded cheese and pulverizing it in the food processor you spread moisture throughout the meatloaf without odd bits of cheese people like my husband and son won’t touch. The unflavored gelatin is not for binding, but actually texture. The results are profound. It takes a few more minutes to saute the vegetables first, but it helps mellow and soften them, so don’t skip that step. Glazed All-Beef Meatloaf recipe adapted from Cook's Illustrated, moist tender meatloaf with a zesty tomato based glaze on top. Spread shredded cheese on a plate and put in the freezer. Adjust oven rack to the middle and preheat oven to 375 degrees. Lightly grease a broiler pan or place a wire rack in a rimmed baking sheet, top with aluminum foil and poke holes every 1/2 inch or so with a skewer for drainage. Whisk broth and eggs in a large bowl. Sprinkle gelatin on top of mix and let it sit. Add onion mixture to broth/egg mixture along with cracker crumbs, parsley, soy sauce, mustard, salt and pepper. Remove cheese from freezer and either by hand, or with a food processor/blender, crush into a powder. Add to the other ingredients and mix until thoroughly combined. Add meat and mix gently until just combined. Shape into a large rectangle (approximately 10 x 6 inches and 2 inches high) on the prepared pan. Bake for 55 to 65 minutes until it reaches an internal temperature of 135 degrees. While loaf is baking, combine glaze ingredients in a small sauce pan and simmer for 5 minutes. When meatloaf is done, remove from oven and turnoven to broil. Spread half of glaze over meatloaf. Broil for about 5 minutes until it bubbles and begins to brown. Repeat with remaining glaze. Let meatloaf rest for 20 minutes before slicing.